SOUTHFIELD, Mich., Jan. 24, 2019 – Kässbohrer PistenBully snow groomers are now being painted by a Dürr robot. This cuts the painting process time in half, because application by robot is much faster than manual application by a worker. For the internationally leading manufacturer of specialist vehicles for slope preparation, automating the process means greater efficiency in production and less exposure to paints and solvents for workers. Temperatures below freezing, sharp ice crystals, strong UV radiation: when used on slopes and cross-country skiing trails, the surfaces of the PistenBully cabs are subjected to the most extreme conditions. To provide protection against the harsh environmental influences, two primer coats as well as the base coat are applied by an EcoRP L033 painting robot from Dürr, which coats the metal frames from the outside and inside. “The most time the robot needs to paint a cab is an hour. Compared to previous painting by hand, this saves us so much time that we’ve been able to significantly increase our output to 600 cabs per year,” says Uwe Thierer, Plant Manager at Kässbohrer Geländefahrzeug AG’s Laupheim site. Apart from the speed, the robot’s uniform and reproducible quality ensures a high efficiency gain in the process. The paint layers are applied in a combination booth. First, the EcoRP L033 applies two primer layers as a bonding agent and corrosion protection wet-in-wet without drying in-between. The color changing and dosing technology integrated in the front robot arm ensures minimal paint losses when changing color as well as short rinsing times with minimal solvent consumption. This is followed by the intermediate drying stage before the third painting stage, the base coat as color application. Dürr’s scope of delivery also includes the skid conveyor technology with turntable and tilt function. This ensures reproducible cab adjustment and correct positioning of the cab for the painting process. 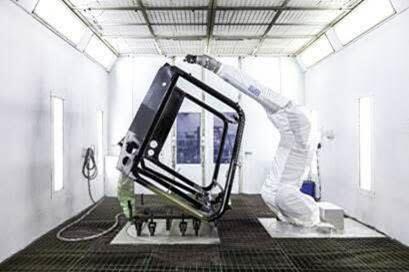 The robot paints the cab body fully and by applying two primer layers also looks after the corrosion protection, which in automotive painting takes place in the tank. Five pressure pots for main color, hardener, and thinner are provided for the paint supply. Health protection is another important argument in favor of automating the painting process. When done by hand, workers are exposed to paint and solvent fumes. When a robot is used, this burden is removed from the workers. As part of the automation process, Kässbohrer also switched to chromate-free paint for the manufacture of the PistenBully. The Dürr Group has been established in the United States since 1970 and currently employs around 880 people. 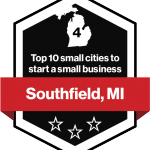 From the new Campus with a state-of-art validation, testing, and training center in Southfield, MI, Dürr USA represents four of the five divisions. Paint and Final Assembly Systems offers equipment for painting and assembly processes, while Application Technology provides paint application systems. Dürr’s Clean Technology Systems is the global leader in air pollution abatement and energy efficient technologies. The subsidiary Schenck Trebel Corporation, based in Deer Park, New York, offers balancing machines, vibration and condition monitoring systems and services for the general industry. The customers of Dürr USA include automotive and commercial vehicle manufacturers as well as their suppliers, and a diverse group of other industries. HOMAG Machinery North America operates the production facilities for HOMAG Group in Grand Rapids, MI, which is also the base for sales and service company Stiles Machinery Inc.